Rostov ‘41 is a Standard Combat Series (SCS) game covering the bold—some would say “foolhardy”—dash by Army Group South to take Rostov in the late fall of 1941. Amazingly, the attack succeeded, resulting, however, in the Germans being isolated at the end of a logistical shoestring. The regrouping Red Army, stung from a long series of defeats, saw this as the perfect opportunity to launch its first coordinated attack of the war, thus paving the way for the Moscow Counteroffensive just a few weeks later. 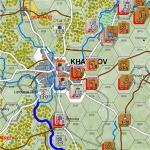 Rostov ‘41 covers all this swirling mobile action in turns representing 3 to 6 days and at a map scale of 2.5 miles per hex. Units are battalions to divisions. Low counter density and a wide-open map bring all the action and possibilities to light in some wild gameplay. Both players will find themselves under the gun. The German player must use his limited and overstretched forces to pull off a brilliant coup. Playing it safe won’t cut it; speed is all-important. With a lot of skill and a bit of luck, Rostov will be yours. Then you’ll have to pay the piper. The Russian player must conserve his forces as the German rapier expends its energy. While the capture of Rostov requires a lot of skill and some luck on the German part, don’t begin to think your job is easy. Derailing that German drive can easily consume precious forces needed for your main effort: turning the tables on the Germans and taking back great swaths of the Motherland.